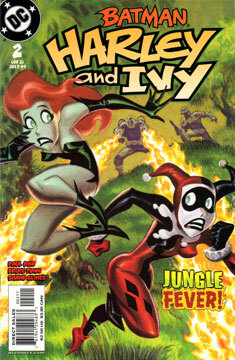 The story picks up with Harley and Ivy already in Costa Verde, but imprisoned by its corrupt President Juan Ceballos. The girls pick a fight with their female captors and are about to make good their escape, when soldiers appear and lead the girls away at gunpoint to meet El Presidente. Harley reveals their plans to find a Zombie Root, and Ceballos wants a cut to allow them access. In a surprising move, Harley pushes Ceballos into a kiss with Ivy, and then takes out the guards with a few well-timed moves. With Ceballos under Ivy’s spell, the girls race into the jungle in a specialized jungle vehicle. It’s not long before they run into Slash and Burn, a couple of thugs hired to raze the jungle to the ground. Using the weapons on the truck, Harley and Ivy quickly bypass the threat. In short time they are in the jungle, and quickly find a Zombie Root. Ivy takes a moment to give herself over to the jungle, while Harley waits, miserable and bug-bitten. Just as Ivy returns from her plant sojourn, Slash and Burn return with murderous intent. Harley tangles with Slash, and ends the fight when she sprays seltzer water on his attached chain saw, electrocuting him. Ivy takes down Burn with poison-dart frogs. The girls leave Coste Verde, but not before Ivy tells Ceballos to create a rainforest reserve in the name of Isley and Quinzel. Back in Gotham, Alfred reads of their exploits in the newspaper, and Batman swears the girls will wish they had stayed in the jungle if they return to Gotham. A great issue! We really get to see the personality of both gals shine in this one. And both have opportunities to play to their strengths. These are not wilting flowers to be trifled with! These ladies and strong, willful, and independent. Love it! More variations on Harley and Ivy in their undies. But the big new characters are Slash and Burn. Those would be fun customs to make.